With some of the best flight connections in the world, Dubai and Abu Dhabi international airports are perfect hubs for bringing together event attendees from across the globe. For our last incentive we stepped out of busy Dubai and took a UK group for 3 days in the Abu Dhabi sunshine. Here we share how to get the most luxurious and indulgent experience from just 72 hours in Abu-Dhabi. Fly overnight into Dubai or Abu Dhabi and land first thing the next morning with the full day ahead of you. Virgin Atlantic do an overnight flight out of London Heathrow that brings you into Dubai for 10am, and therefore into Abu Dhabi by lunch. The fastest way to get from Dubai into Abu Dhabi is by helicopter which is widely available and well priced. If you prefer to keep your feet on the ground, the coach is also just a 2 hour journey along one stretch of road. P.S. If you are feeling extra decadent, use the Virgin Atlantic lounge at Heathrow T3 - it is the world’s most indulgent airport lounge, bar none. Perfectly located, this “business” hotel is a complete surprise. It might not delight you from the outside but once you step out onto the rooftop pool you will understand why we chose it. On the middle floor there is a breathtaking sunset bar with candlelit poolside gazebos and lounge cabanas for laid back drinking. Breakfast: Head to the rooftop hotel gym for endless views, or put your trainers on and jog down the promenade. Breakfast at the hotel is a sumptuous buffet with culinary selections from all over the world. Morning: The beauty of Abu Dhabi is that it can be mostly explored in a day. Get up early and head to Yas Marina Circuit for drag racing on the first ever track to allow Formula 1 under lights. You can drive yourself, or be driven, and race each other for the ultimate reaction times and top speeds. Warning - highly competitive activity sure to cause drama between friends. 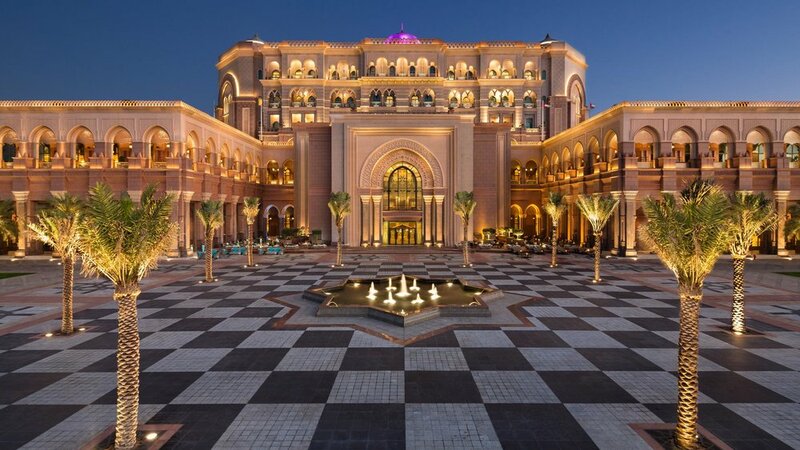 Lunch: Emirates Palace is an exquisite piece of design featured in almost all Abu-Dhabi skyline postcards. Considered the height of hotel luxury, non-residents can book to use the spa, take afternoon tea or for a lunch booking. When you book for lunch, request an outside table and marvel at the views over the bay. Also, order the sushi. All of the sushi. Afternoon: Once full of sushi, have the wonderful hotel team drive you out to one of the piers by golf cart (who walks these days anyway?) and pick up a speedboat. The experience is everything you hope it will be and the hosts are utterly lovely. To really appreciate the dramatic skyline of Abu Dhabi you need to see it from the water; so why not see it at full speed? For your final stop of the day visit the Sheikh Zayed Mosque. Go here with an open heart and a curious mind, and the tranquility and sheer beauty of the mosque can heal your soul. Full abayas or covered heads are required for women and the men may not wear shorts or sandals. Dinner: For great food, great wine and a table on the terrace, head to Italian favourite Prego’s at Beach Rotana. The atmosphere is just lovely and it is the perfect cap to a busy day. Party: Head back to Yas Island’s Iris Bar and dance the night away to 80s and 90s tunes. They’re open until 3 and even have free drinks for ladies on Sunday nights. Leave the morning free for leisure time. Take an invigorating tip in the rooftop pool, or gently soak your sore dancing feet, and enjoy the views. The hotel provides free shuttles to Abu Dhabi Mall and the beach so you are never short of things to do.For the final afternoon/evening, head into the desert on a Jeep safari. The wonderful team at Pure Arabia offer the perfect desert safari programme, including collection from your hotel. If you haven’t before discovered the peace of the Abu Dhabi desert, with its rolling sand dunes and expansive horizons, you need to try it. Stay until sunset and watch the sun descend beneath the horizon. After a peaceful stop in Instagram heaven, hop back in your safari Jeeps for a stomach-turning go at dune bashing. Not for the travel sick, this calls for holding on tight and bracing for impact, or indeed screaming with fear and delight at your driver. Wake Up. Fly Home. Have the blues. This amazing trip would not have been possible without the support of our amazing industry partners.